Smart ties are dark ties. That is a rule of thumb not hard to understand: a dark tie is less showy, more discreet, more serious. It is also easier to wear a dark tie with an outfit. The Lawyer Background that I have described elsewhere on this site exists as it does because it is one of the few outfits with which one can effectively wear a bright tie. Dark ties have had a particular popularity in the UK as a result of the club and military ties that predominated after the Second World War (and led to the growth of Jermyn Street as a source of colourful shirts to lie behind those ties). But I would say that the dark tie is a staple in two situations. First, when the aim of your outfit is to be sober, simple and classic in your look (as many of Italian gentlemen featured on this column have been). And second, when you require a simple background that will not clash with an otherwise adventurous shirt/suit/coat. This is The Italian Background also mentioned previously on this site. All this is by way of introduction to one suggestion: try purple or green as an alternative dark tie. Navy blue would be the standard, followed by black and dark grey. I wear all three often. But I also have a particular penchant for (very dark) purple and (very dark) green as alternatives for a dark, smart tie. 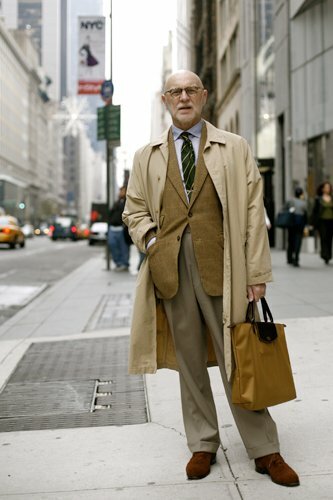 In the image at top, courtesy of the Sartorialist, writer Bruce Boyer works the look extremely well, using a dark green, club-striped tie as a good background for the combination of patterns and tones elsewhere. You can follow the discussion on The quiet sophistication of purple and green by entering your email address in the box below. You will then receive an email every time a new comment is added. These will also contain a link to a page where you can stop the alerts, and remove all of your related data from the site. I totally agree with you Simon about the sophistication of purple and green. In some careful doses these colours really can transform an outfit and it’s something you guys can do brilliantly with a tie. I just wish it was as simple for us girls sometimes! Purple is to ties what pink is to shirts: an excellent, interesting, and uncommon option to combine smartness with pizazz that will not run the risk of turning the wearer into a clown. James - when you say there are Italians who come into town for much less every three months, who would you recommend? What range for make?